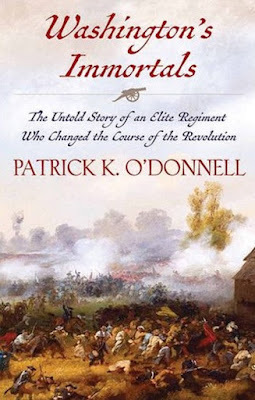 Veteran journalist and author Joseph C. Goulden offers a good review in the Washington Times of Patrick K. O'Donnell's Washington Immortals: The Untold Story of an Elite Regiment Who Changed the Course of the Revolution. As a military historian, Patrick O’Donnell has a passion for walking through battlefields. In 2010, he found himself in a scruffy area of Brooklyn — auto repair shops, warehouses and the like — that was the site of one of the first engagements of the Revolutionary summer of 1776. So who were these men? How did they come to be part of Gen. George Washington’s nascent, ragtag army so early in the war? At hand is a boots-on-the-ground account that draws upon a medley of obscure sources, including pension records, to personalize brave men whose names have fallen into the crevices of history. In declaring independence, the colonists faced battle with a British army that was arguably the most proficient military force in the world. Officers and enlisted men alike boasted years of experience. Conversely, the colonial forces were “a mongrel group made up of amateurs,” in Mr. O'Donnell’s words. So the patriots sought to level the field. One key player was a Baltimore businessman and civic leader named Mordecai Gist, who was 32 years old the winter night in 1774 when he called a meeting of the city’s social elite at a tavern. The issue: the creation of an “independent military company” of Marylanders to protect their rights, even to the point of breaking away from Britain.